Abdominal CT scan with multiple dilated small bowel and right femoral hernia sac containing small bowel. 5 mm trocar through hernia sac surrounded with Allis clamp. Vascular congestion in previously incarcerated small bowel. Femoral hernias presenting with incarceration and small bowel obstruction is usually treated with repair of the hernia with exploration of the peritoneal cavity to ensure the viability of the small bowel and repair the hernia. 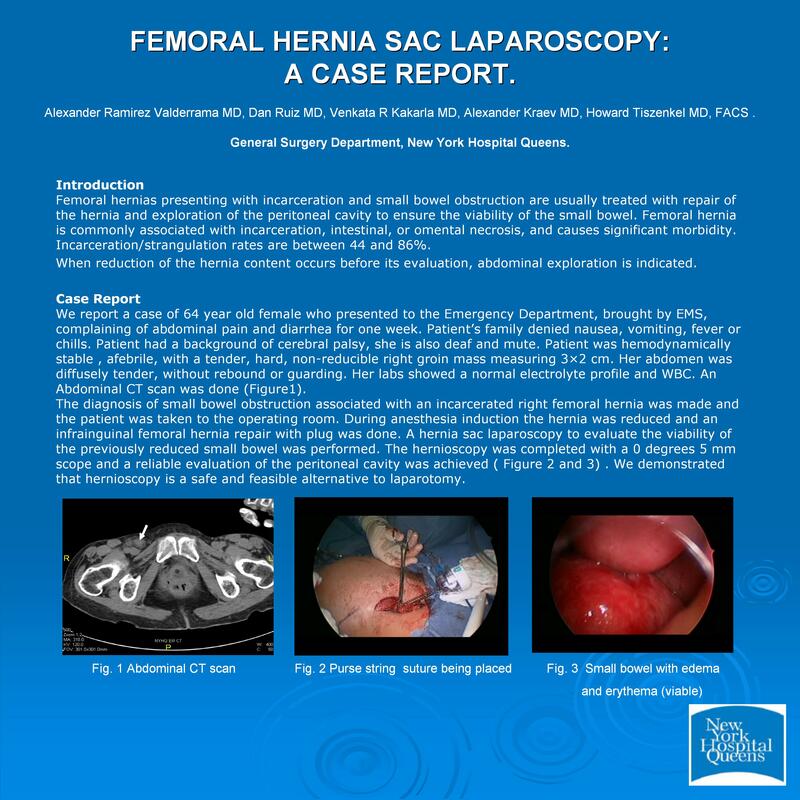 We report a case of 64 years-old-woman with small bowel obstruction associated with an incarcerated right femoral hernia successful treated with open femoral hernia repair with plug and hernia sac laparoscopy to evaluate the viability of the previously reduced small bowel. The hernioscopy was performed with a 0 degrees 5 mm scope and a reliable evaluation of the peritoneal cavity was achieved. We conclude that hernioscopy is a safe and feasibility procedure in the management of acute small bowel obstruction due to incarcerated femoral hernia.